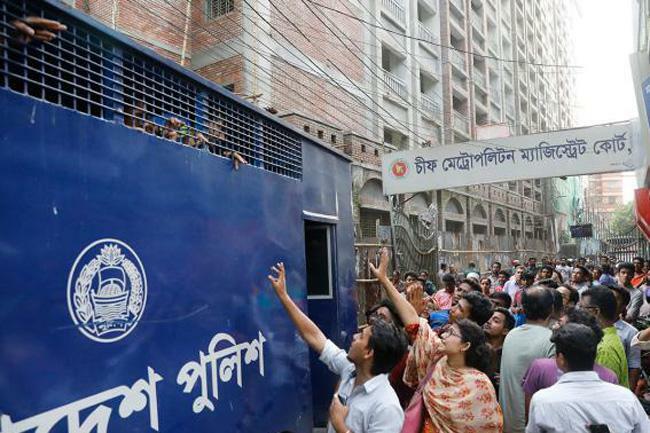 Separate courts in Dhaka on Sunday granted bail to 16 private university students accused in two cases filed over vandalism and attacks on police during the student movement demanding road safety. The students are Mashad Mortuza Bin Ahad, Sakhawat Hossain Nizhum, Shihad Shahriar, Ajijul Karim Antor, Mahedi Hasan, Foyez Ahmed Adnan, who were booked in a case filed with Bhatara Police Station, and Noor Mohammad, Jahidul Haque, Iftekhar Ahmed, Mohammad Hasan, Redwan Ahmed, Tariqul Islam, AHM Khaled Reza, Reza Rifat Akhlaq, Rashedul Islam, and Mushfiqur Rahman who were accused in case filed under Badda Police Station. Dhaka Metropolitan Magistrate AKM Moinuddin Siddiqi granted bails to 15 students while Chief Metropolitan Magistrate Saifuzzaman Hero granted bail to Iftekhar Ahmed after hearing their separate bail petitions filed. Later, they denied bail for several times. Protests flared across Bangladesh on July 29, when two college students were run over in Dhaka – becoming victims of the unruly transportation sector of the capital.